The company runs hardware load balancers and multiple web applications serving their websites and orchestrates environments using combinations of scripts and Puppet. The website generates large amounts of log data daily that requires archiving. A firewall, switches and load balancers on the public facing network connections. OpenStack Controller service running Image service, Identity service, Networking service, combined with support services such as MariaDB and RabbitMQ, configured for high availability on at least three controller nodes. OpenStack compute nodes running the KVM hypervisor. OpenStack Block Storage for use by compute instances, requiring persistent storage (such as databases for dynamic sites). OpenStack Object Storage for serving static objects (such as images). Running up to 140 web instances and the small number of MariaDB instances requires 292 vCPUs available, as well as 584 GB of RAM. On a typical 1U server using dual-socket hex-core Intel CPUs with Hyperthreading, and assuming 2:1 CPU overcommit ratio, this would require 8 OpenStack Compute nodes. The web application instances run from local storage on each of the OpenStack Compute nodes. The web application instances are stateless, meaning that any of the instances can fail and the application will continue to function. MariaDB server instances store their data on shared enterprise storage, such as NetApp or Solidfire devices. If a MariaDB instance fails, storage would be expected to be re-attached to another instance and rejoined to the Galera cluster. Logs from the web application servers are shipped to OpenStack Object Storage for processing and archiving. Additional capabilities can be realized by moving static web content to be served from OpenStack Object Storage containers, and backing the OpenStack Image service with OpenStack Object Storage. Increasing OpenStack Object Storage means network bandwidth needs to be taken into consideration. Running OpenStack Object Storage with network connections offering 10 GbE or better connectivity is advised. Leveraging Orchestration and Telemetry services is also a potential issue when providing auto-scaling, orchestrated web application environments. Defining the web applications in a Heat Orchestration Template (HOT) negates the reliance on the current scripted Puppet solution. OpenStack Networking can be used to control hardware load balancers through the use of plug-ins and the Networking API. This allows users to control hardware load balance pools and instances as members in these pools, but their use in production environments must be carefully weighed against current stability. Using a scale-out storage solution with direct-attached storage (DAS) in the servers is well suited for a general purpose OpenStack cloud. Cloud services requirements determine your choice of scale-out solution. You need to determine if a single, highly expandable and highly vertical, scalable, centralized storage array is suitable for your design. After determining an approach, select the storage hardware based on this criteria. If storage protocols other than Ethernet are part of the storage solution, ensure the appropriate hardware has been selected. If a centralized storage array is selected, ensure that the hypervisor will be able to connect to that storage array for image storage. 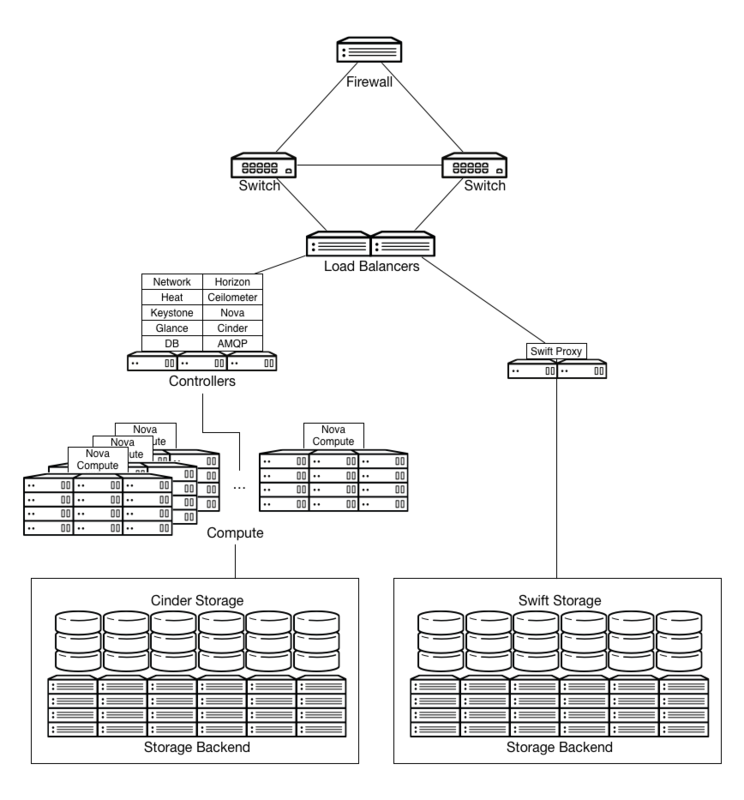 How the particular storage architecture will be used is critical for determining the architecture. Some of the configurations that will influence the architecture include whether it will be used by the hypervisors for ephemeral instance storage, or if OpenStack Object Storage will use it for object storage. Where instances and images will be stored will influence the architecture. If the solution is a scale-out storage architecture that includes DAS, it will affect the server hardware selection. This could ripple into the decisions that affect host density, instance density, power density, OS-hypervisor, management tools and others. Hardware resources selected for the resource nodes should be capable of supporting enough storage for the cloud services. Defining the initial requirements and ensuring the design can support adding capacity is important. Hardware nodes selected for object storage should be capable of support a large number of inexpensive disks with no reliance on RAID controller cards. Hardware nodes selected for block storage should be capable of supporting high speed storage solutions and RAID controller cards to provide performance and redundancy to storage at a hardware level. Selecting hardware RAID controllers that automatically repair damaged arrays will assist with the replacement and repair of degraded or deleted storage devices. Disks selected for object storage services do not need to be fast performing disks. We recommend that object storage nodes take advantage of the best cost per terabyte available for storage. Contrastingly, disks chosen for block storage services should take advantage of performance boosting features that may entail the use of SSDs or flash storage to provide high performance block storage pools. Storage performance of ephemeral disks used for instances should also be taken into consideration. Object storage resource nodes have no requirements for hardware fault tolerance or RAID controllers. It is not necessary to plan for fault tolerance within the object storage hardware because the object storage service provides replication between zones as a feature of the service. Block storage nodes, compute nodes, and cloud controllers should all have fault tolerance built in at the hardware level by making use of hardware RAID controllers and varying levels of RAID configuration. The level of RAID chosen should be consistent with the performance and availability requirements of the cloud. For a compute-focus architecture, we recommend designing the network architecture using a scalable network model that makes it easy to add capacity and bandwidth. A good example of such a model is the leaf-spine model. In this type of network design, you can add additional bandwidth as well as scale out to additional racks of gear. It is important to select network hardware that supports port count, port speed, and port density while allowing for future growth as workload demands increase. In the network architecture, it is also important to evaluate where to provide redundancy. For a general purpose OpenStack cloud, the OpenStack infrastructure components need to be highly available. If the design does not include hardware load balancing, networking software packages like HAProxy will need to be included.